Lock options: 4 Way. LCD show location of 3 cats and when the last cat used the flap. Pet Mate Limited. This is a quality item for a very good price. PRODUCT DETAILS. Single / double-glazing. 5cm D 13. 5cm H 26cm. implanted microchip or RFID collar disc. Lock Options 4 Way. The last cat used The flap. Accessories Dog & Cat Doors Dog & Cat Doors. The SureFlap Microchip Pet Door is designed for large cats and small dogs. To fit through the pet door, your pet's shoulders should ideally be no wider than 170mm and the circumference of their waistline at its widest point should be no more than 518mm. The brush sealed flap with magnetic closure ensures a draftproof and weatherproof seal. Cat Mate Microchip Cat Flap. The streamlined design of the Cat Mate Microchip Cat Flap maximises entrance opening space - providing easy, stress-free access for your cat. 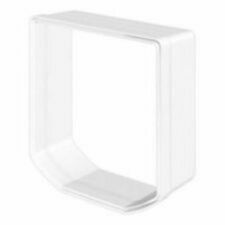 A Mounting Adaptor is required for glass installations & one or more SureFlap Tunnel Extenders may be required for wall installations. The SureFlap is battery powered using 4 AA batteries which last up to a year with normal use. Works with your cat's existing microchip to keep out intruder cats and wildlife. 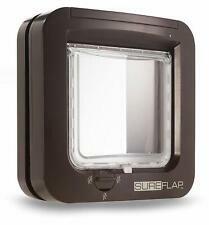 SureFlap Microchip Cat Flap. 1 x Microchip Cat Flap. Selective entry but allows any animal to exit. The microchip reader is located on the outside of the cat flap only. Set includes 1 x Microchip Cat Flap 3 x sets of screws (various lengths) Instruction manual. 1 x Microchip Cat Flap Connect. The cat flap is battery powered and requires 4 x AA batteries (not included) which will last up to six months with normal use. DualScan™ technology lets you keep certain cats indoors. The streamlined design of the Cat Mate Microchip Cat Flap maximises entrance opening space - providing easy, stress-free access for your cat. The brush sealed flap with magnetic closure ensures a draftproof and weatherproof seal.